Who got what? And what are they doing with it? Nine lucky states and the District of Columbia jump-started the new year this January with welcome extra cash from the $4.35 billion federal Race to the Top fund. 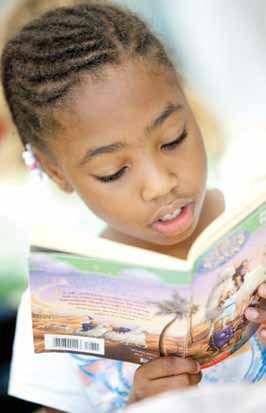 A student from E.L. Haynes Public Charter School catches up on her reading. The second-round winners, in addition to the first-round winners, Delaware and Tennessee, will get the opportunity to be national leaders in education reform and millions of federal dollars to help them forge ahead. The statewide pilot projects will focus on turning failing schools around, implementing performancebased evaluations of teachers and administrators, building better data systems, and adopting assessment tests that accelerate learning instead of “dumbing down” curricula and forcing schools to teach to the test. With U.S. students losing ground to those of other nations, the urgency for reform is great, officials say. But overhauling the way education is delivered requires fundamental structural change that is extraordinarily hard to achieve. Race to the Top seeks to succeed where earlier efforts failed by adopting a multifaceted approach and offering financial incentives to lighten the burden of new initiatives in this difficult budgetary climate. Like first-round winners Delaware and Tennessee, the second-round winners were credited with the full amount of their respective four-year grants, subject to federal oversight and completion of the work. The awards were based on population and ranged from $700 million apiece for Florida and New York to $75 million apiece for Hawaii, Rhode Island, and the District of Columbia. Somewhat overshadowed by the announcement of the second-round winners, this past August, was the awarding of $350 million the following month to two multistate collaborative efforts to develop better student assessment tests by 2014. This work is already under way. Federal officials hope that these joint endeavors will also foster more collaboration among states. In fact, the Race to the Top reform movement has already sparked spontaneous collaboration among many states, winners and nonwinners alike. For example, the District of Columbia (a second-round winner) invited all superintendents in Delaware (a firstround winner) to a conference at E. L. Haynes Public Charter School in January to discuss data-driven strategies and best practices. Although the $4.35 billion awarded in the onetime Race to the Top challenge has been disbursed, federal officials hope to continue fiscal support for education reform by means of smaller but continuous annual appropriations starting with $1.35 billion in fiscal 2011. However, the current federal budget, whose 2011 fiscal year began last October 1, was still awaiting final approval by late December. The 2011 challenge may also differ from the original Race to the Top in that individual school districts and local education agencies, in addition to states, may be eligible to apply. As of late December, federal officials were not able to estimate when states and/or school districts would be able to apply. Am educator from E.L. Haynes Public Charter School works with her students. Taking issue with the Race to the Top approach to reform, the Foundation for Educational Choice recently released a study concluding that earmarking another $4 billion in available stimulus funds for schoolchoice vouchers would spark more genuine reform than Race to the Top, which, it contends, simply “bails out” existing schools without changing the system through reform. The foundation, instead, advocates offering private-school scholarships of $2,000 to $2,500 each to 630,000 students over the next five years. Not only will students achieve more in private school, the report concludes, but states will save money through reduced enrollment, and the increased competition will spur public schools to improve. Federal education officials declined to comment. Winnowing 35 finalists to 10 winners last summer was apparently a daunting task. Based on interviews with officials in Massachusetts (first place), the District of Columbia (sixth), and Georgia (eighth), the deciding factor was that reform was not just proposed by the state in question; it was already well under way there. “We have a 17-year track record of reform… and the results to show for it,” says Mitchell Chester, Massachusetts commissioner of elementary and secondary education. “We’re tops in the nation” overall but need to close the gap for the neediest students and worst-performing schools, he says. For Georgia, what made the difference was a focus on accountability and support at all levels. These standards have recently been strengthened, says Erin Hames, policy director for the office of the governor, by the adoption of student-assessment benchmarks to show academic growth over time and by new leadership-effectiveness principles that give individuals, schools, and entire districts incentives to work together for the good of everyone. Unlike most state contenders, Georgia opted to enlist only 21 of its 181 districts as Race to the Top partners, Hames says. Its strategy is to work closely with a handful of districts on “very aggressive” pilot projects and then scale them statewide. The decision to work with fewer districts, she says, also means that each participating district gets enough funding to accomplish something rather than a token amount. In addition, a smaller number of districts is easier to manage. In New England, Massachusetts is focusing its reform efforts on turning around 35 underperforming schools, of which 12 are in Boston and 10 are in Springfield, within three years. The schools’ turnaround plans include a revamped school day, extra class time, and a “very aggressive” effort to replace nonperforming teachers and principals, says Mitchell Chester, state commissioner of elementary and secondary education. In addition, he says, Massachusetts expects to have new regulations in place this summer that incorporate student performance as a criterion for teacher evaluation; these measures will have to be negotiated at the local level, but the state essentially is setting the bar for expectations. Race to the Top will be “a tremendous catalyst” for Massachusetts, enabling it to be “very aggressive” on reform during a “very tough” economy, Chester says. What can other states learn from Race to the Top winners? Georgia made an intensive effort to involve a broad group of stakeholders in the application process, including teachers, business leaders, and legislators, according to Erin Hames, policy director for the governor’s office. By rallying these interest groups around the reform objectives and agenda, the state won wide support for its plans. Student achievement is the theme throughout, the goal being a year’s learning in a year’s time. Jennie Niles is founder and principal of an award-winning Washington D.C. charter school that is a model for ed reform in the nation’s capital and nationwide. Finally, Washington, D.C., whose Race to the Top initiative was headed by the founder and principal of an award-winning charter school, has been leading education reform for more than a decade. According to Jennie Niles of E. L. Haynes Public Charter School, the nation’s capital is small enough to be an excellent showcase for education reform, as it can show results and demonstrate success. The District of Columbia successfully argued in its application that it was already well on the way to reform and needed a second- wind boost of energy from Race to the Top, Niles says. “We have a very dynamic environment” in Washington, where nearly 40 percent of public school students attend charter schools, she adds. Former District of Columbia education chancellor Michelle Rhee, who resigned this past fall, fostered a dynamic reform environment and wasn’t afraid to steal ideas from anywhere, Niles says. When Washington’s grant application was pending, last spring, she adds, Rhee pushed through a districtwide provision (except for charter schools) that mandated performance-based evaluations for the hiring, firing, and promoting of teachers. With its Race to the Top funding, the District of Columbia will now create a D.C.-wide plan that covers regular public schools as well as charters (which are governed separately), Niles says. If the District of Columbia can be a showcase for national education reform, the E. L. Haynes Charter School could itself be a showcase for the District of Columbia. The six-year-old school has won a silver award from New Leaders for New Schools each of the past three years and has ranked as one of the top charter schools nationwide. Its students increased their standardized test scores by 50 points in math and 26 points in reading from 2007 to 2009. Niles, a graduate of New Leaders for New Schools’ training program for urban principals, designed Haynes’s program with help from experts all across the country, according to four tenets: data-driven instruction, outstanding teachers, strong professional development (250 hours a year), and a yearround calendar. The school offers eight weeks of optional programs, having boosted its maximum annual hours of instruction from 1,200 hours to 2,200. Haynes designed its own interim assessment tests with help from New Leaders for New Schools and scored and analyzed the results with the assistance of the Achievement Network. In addition, Niles says, the school worked with KIPP DC, the local chapter of the Knowledge Is Power national teaching program, to create its own residency in-training program for teaching urban students.